I woke up on the day of the semi-final feeling very nervous. Most weeks I don’t get my hopes up and don’t take defeats too badly as there is always next week, but we have only reached the FA Cup final once in our history so the result of this match mattered ….. a lot. Getting ready to leave for the game takes on ridiculous levels of obsession with tiny details. Is this an appropriate top to wear? Have my Watford socks with the mismatched colours at the top been lucky or unlucky? Did I start wearing my warm coat before our form dipped? So many questions with inconclusive answers. In the end, the most important things were to remember my ticket and my yellow shirt, but the sartorial decisions nagged at me. A game at Wembley really should end with the presentation of a trophy, I am not a fan of using it as a venue for the semi-finals. So even entering the ground had a sense of anti-climax. Earlier in the day, mention had been made of friends who had to miss the game for various reasons and someone expressed the opinion that it wasn’t such a huge deal as, if we lost, you wouldn’t want to have been there and, if we won, there would be another trip to Wembley for the final. A key question regarding the team selection was the choice of goalkeeper. I would have picked Gomes, who has been immense this season, but Flores chose to keep faith with Pantilimon who played in the earlier rounds of the cup. So the starting XI was Pantilimon, Aké, Cathcart, Britos, Nyom, Jurado, Watson, Capoue, Abdi, Deeney and Ighalo. As we gathered in the concourse before the game, it was lovely to see one of my all-time Watford heroes, Nigel Gibbs, was also in attendance. Prior to kick-off, there was a great display of red and blue foils in the Palace end, they do that sort of thing so well, but we are fortunate that a sea of yellow shirt is always striking. 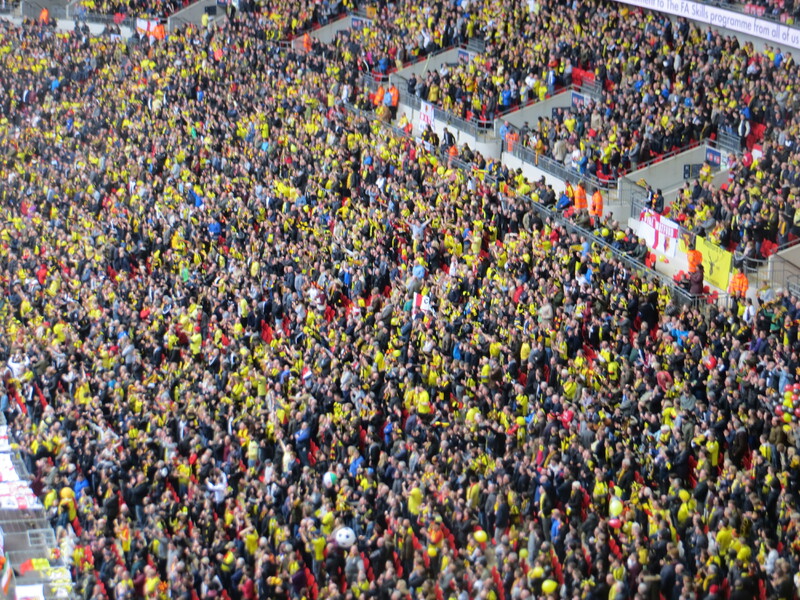 Following complaints about the lack of atmosphere among the Watford fans at the play-off final, a singing section had been designated in the lower tier behind the goal and it was great to see them bouncing early doors. Sadly Palace took the lead on 6 minutes as a corner was flicked on to the far post where Bolasie headed the ball past Pantilimon. At that point it already felt as though this was going to be a long afternoon. But Watford rallied and a nice passing move finished with Jurado trying a shot from distance that was blocked. 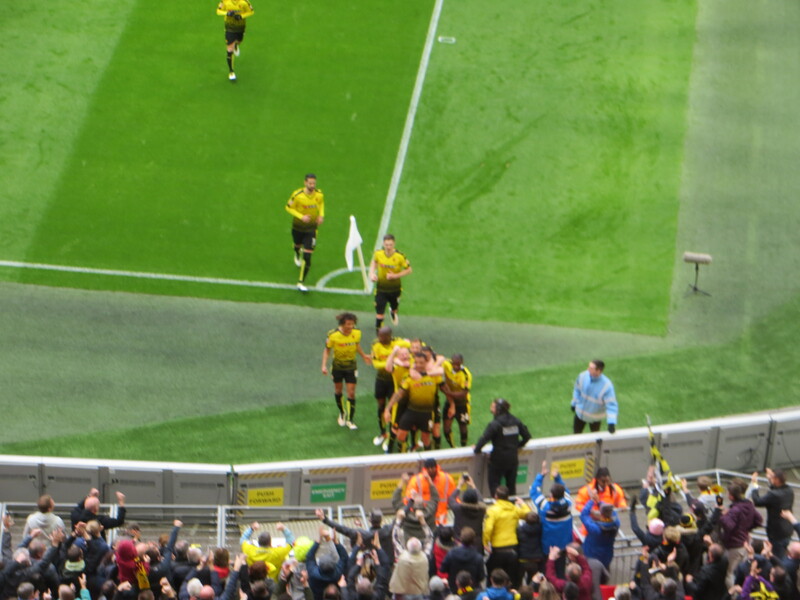 Then Ighalo laid the ball off to Deeney who tried a shot more in hope than expectation and it flew well over the bar. Another nice attacking move saw Jurado find Abdi whose shot was blocked. During our pre-match discussions, John had commented that our third most prolific goal scorer of the season was ‘OG’ and we nearly benefitted again as Ward almost turned a cross from Nyom past Hennessey but it went just the wrong side of the post. 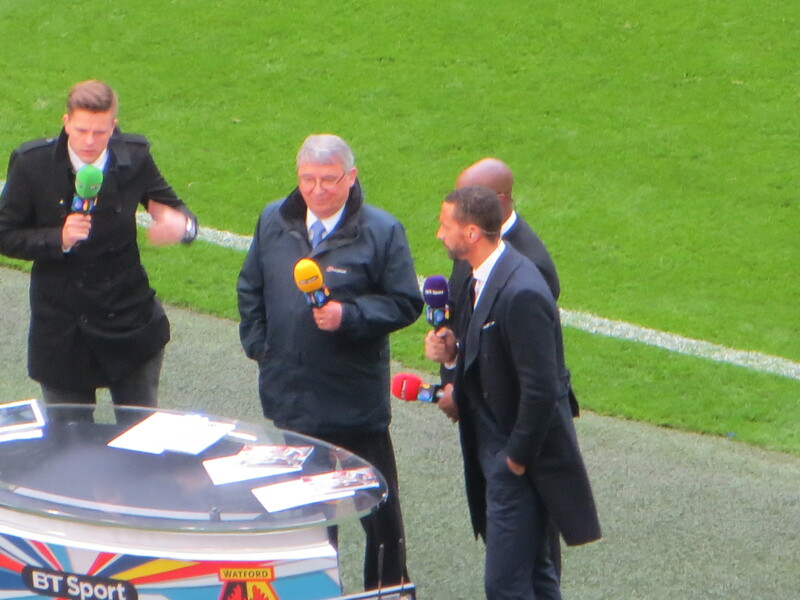 At the other end a cross from Cabaye was punched clear by Pantilimon. 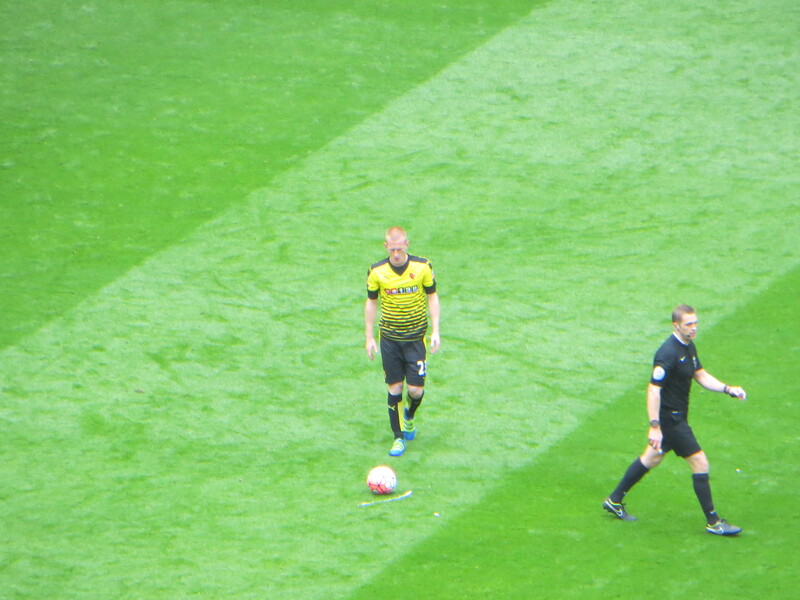 The same player threatened again with a free-kick that was comfortably caught by the Watford keeper. Before the half hour mark, Capoue went down with an injury that required a long period of treatment. He tried to continue, but soon collapsed and had to be taken off on a stretcher, which is always sad to see. Despite it being clear for some time that Capoue would not be able to continue, there was a delay between him being carried off and his replacement taking the field, which was odd as Suárez had pulled on his shirt but remained sitting in the dugout rather than being ready on the sidelines. 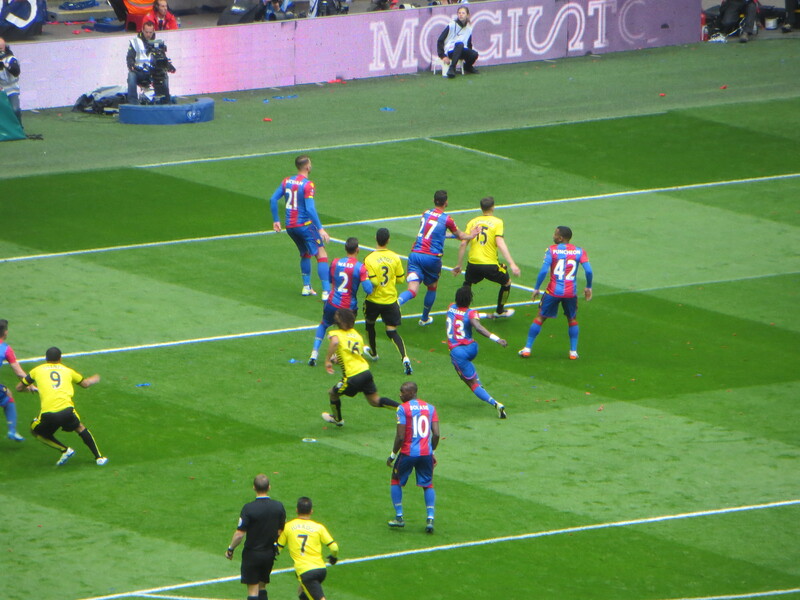 Watford continued to attack without really threatening the Palace goal as a Watson free kick reached Deeney who moved it on towards Ighalo but a defender made the block before the Nigerian could reach the ball. Jurado turned and fired goalwards but, again, it was blocked, this time by Delaney who was knocked to the ground by the force of the shot. 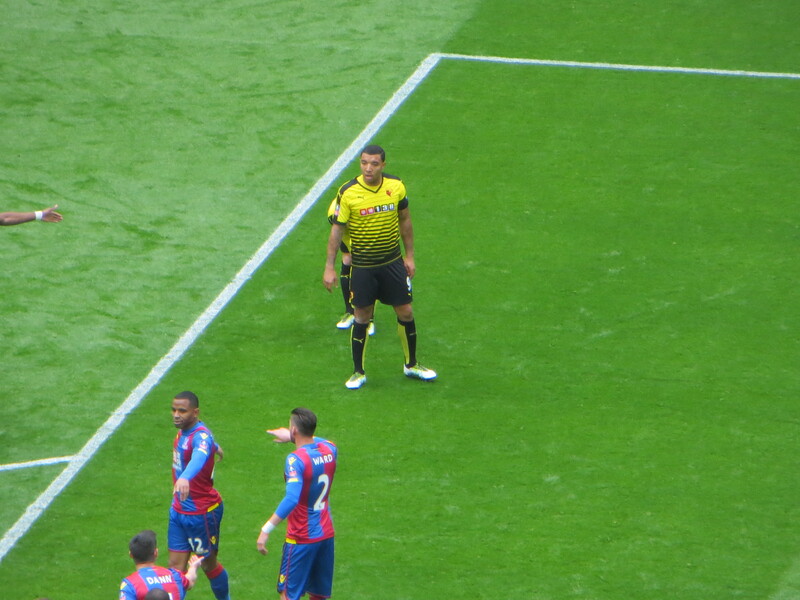 The first caution of the game went to Jurado for a foul on Zaha. Nyom whipped a lovely cross into the Palace box, but Hennessey caught the ball before Ighalo could get to it. Watford were lucky not to concede a penalty just before half time as a cross from Zaha hit Ake’s arm but the referee was unsighted and signaled a corner. So we reached the interval, a goal down. It was interesting to read my notes again as they indicate that Watford had a lot of the play in the first half and, following the early goal, there had been little threat from Palace. But the mood among the Watford fans was dark as, despite our possession, we had never looked like scoring. Our attacks had been ponderous and ineffectual while the Palace wingers, when they did attack, looked very dangerous. It felt like 2013 all over again. However, we have had a number of games this season in which we improved considerably after the break and I clung to the hope that this would be one of them. Watford made a promising start to the second half with an early chance from a Nyom cross which Deeney headed over the bar under challenge. But that was followed by a scare at the other end as Bolasie rode a tackle from Britos and it took a good save from Pantilimon to prevent him from increasing the Palace lead. A Watford free kick was taken short by Abdi to Watson whose shot was deflected off the wall for a corner. This led to our equalizer as Deeney met Jurado’s delivery to head past Hennessey and send the Watford fans wild. You could see how much it meant to him as he ran to our corner to celebrate. All of a sudden both spirits and voices rose among the Watford fans and Flores reacted by replacing Abdi with Guedioura. Abdi had been wasted out on the wing, so this felt like a positive change. Sadly, we were only level for six minutes. Souaré was the first to try to restore the Palace lead with a shot from outside the box that was high and wide. But the man from Senegal turned provider crossing for Wickham who lost Aké and rose to head home. Watford tried to strike back again as Guedioura crossed for Ighalo, but the ball flew over his head to Hennessey. Deeney found himself in space and really should have tried a shot, but hesitated allowing the defence to regroup so he passed to Jurado, who found Suárez, whose shot was blocked. Pardew’s first substitution saw Bolasie make way for McArthur. The big screen announced the substitution and illustrated it with footage of the first goal. Thanks for that. Jurado crossed for Deeney, but his header back across goal was easy for Hennessey. Then a dangerous run by Zaha into the Watford box seemed to spell disaster, but the defence closed him down before he could shoot. The second substitution for Palace saw Sako come on for Puncheon. The Hornets had a great chance to equalize as Deeney flicked a header on to Ighalo but the Nigerian’s shot from close range flew over the bar. Flores made his final change with 7 minutes remaining bringing Anya on for Nyom. Jurado fashioned another chance as a corner was cleared to him but Hennessey was equal to his shot. Palace’s final substitution saw Adebayor on for Wickham so, again, we had a replay of a goal plus the prospect of Adebayor scoring against us again. It was nearly game over as Guedioura gave the ball away to Zaha but, thankfully, he shot into the side netting. The announcement of five minutes of added time was greeted with cheers and encouragement from the Watford fans and boos from the Palace end. The first minute of time added on saw Ighalo directing a cross from Jurado out to Guedioura whose shot was agonizingly just wide of the target. 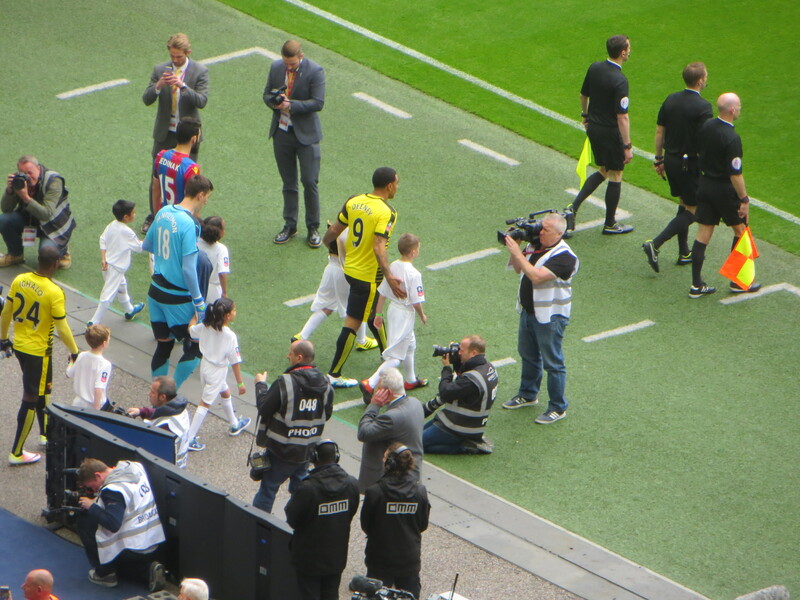 Watford had one final chance as Guedioura tried to find Ighalo in the box, but he was unable to connect and Palace booked their place in the final. It was a frustrating afternoon. Palace’s run in the second half of this season has been as poor as ours so this was a very winnable tie but we struggled in the first half with the early goal sapping spirits on and off the pitch. There was an improved performance in the second period but, apart from a short spell around the time the equalizer was scored, we never looked like winning the game. The queue to get into the station after the game was immense and slow moving and it took forever to get on a train, which I then had to share with Palace fans as I travelled south. I put my shirt and scarf away and tried to block out their chat about going to the final, but I was very glad finally to get on my train home. Generally I try to take positives from games, but it is hard on an afternoon like this. I can take a defeat if we have given our all and were beaten by a better team, but I came away from Wembley thinking that, given the talent in our squad, we should have done better. If you had told me in August that we would retain our status in the Premier League and reach the FA Cup semi-final, I would have been thrilled. But that defeat will hurt for some time. This entry was posted in Watford FC and tagged Adlene Guedioura, Alan Pardew, Allan Nyom, Almen Abdi, Bakary Sako, Ben Watson, Connor Wickham, Costel Pantilimon, Craig Cathcart, Crystal Palace FC, Damien Delaney, Emmanuel Adebayor, Etienne Capoue, Ikechi Anya, James McArthur, Jason Puncheon, Joel Ward, Jose Manuel Jurado, Mario Suarez, Miguel Britos, Mile Jedinak, Nathan Ake, Odion Ighalo, Pape Souare, Quique Sanchez Flores, Scott Dann, Troy Deeney, Watford FC, Wayne Hennessey, Wilfried Zaha, Yannick Bolasie, Yohan Cabaye on April 25, 2016 by franelynn. For those that didn’t realise, the pre match “diner” was a real curiousity, the sort of strange thing that one can blunder into unawares. The sort of place that London does well and surprises nicely. It’s just south, off the Marlyebone Road on Harcourt Road. Opposite is a flag flying Swedish (presumably) Lutheran Church, most of the staff are Swedish and when it was The Harcourt Arms it was a Swedish Pub for a great many years. An Italian owner and a super Swedish menu. We’e all had many pricier meals, but like you Frances – not before a match. Certainly the best part of a pretty unsatisfactory day.